THUNDERSTORMS (no label)(light green) No severe* thunderstorms expected. Lightning/flooding threats exist with all thunderstorms. Winds to 40 mph. Small hail. 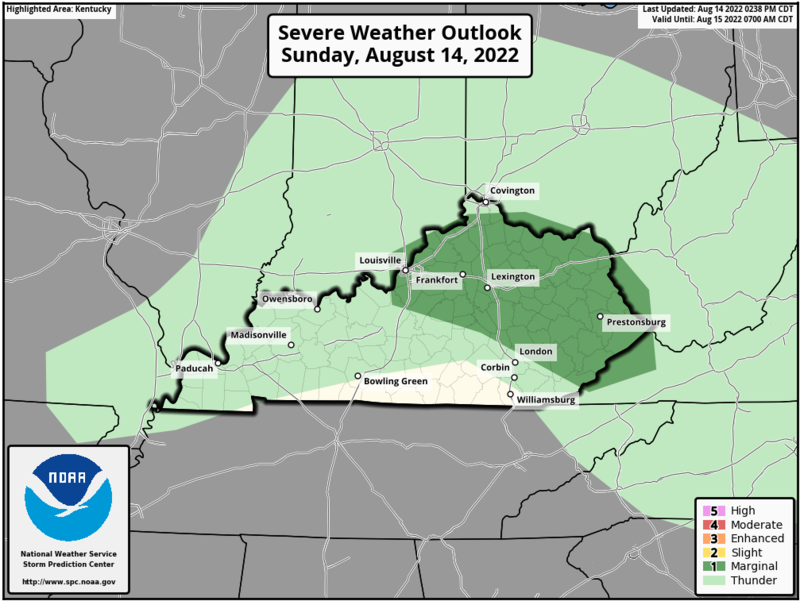 1 - MARGINAL (MRGL)(dark green) Isolated severe thunderstorms possible. Limited in duration and/or coverage and/or intensity. Winds 40-60 mph. Hail up to 1". Low tornado risk. 2 - SLIGHT (SLGT)(yellow) Scattered severe storms possible. 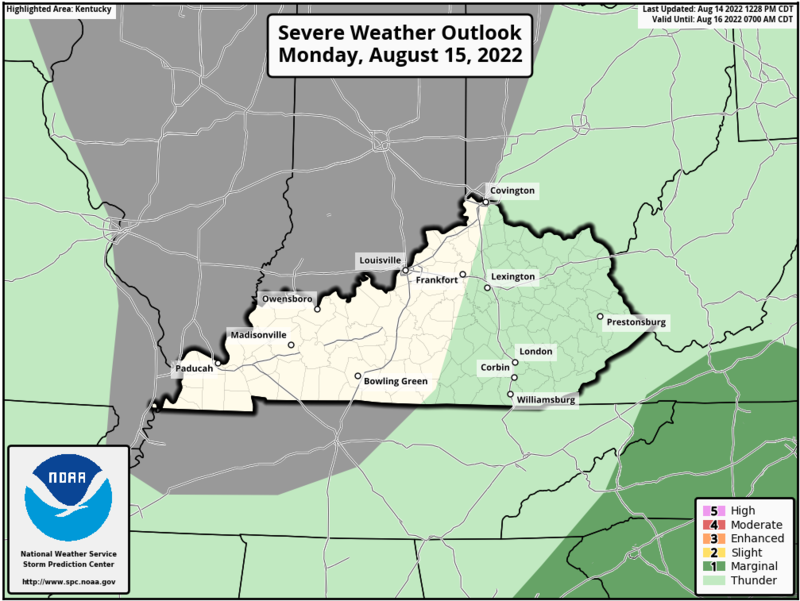 Short-lived and/or not widespread, isolated intense storms possible. One or two tornadoes. Reports of strong winds/wind damage. Hail ~1", isolated 2". 3 - ENHANCED (ENH)(orange) Numerous severe storms possible. More persistent and/or widespread, a few intense. Several reports of wind damage. A few tornadoes. Damaging hail, 1- 2". 4 - MODERATE (MDT)(red) Widespread severe storms likely. Long-lived, widespread and intense. Strong tornadoes. Widespread wind damage. Destructive hail, 2" +. 5 - HIGH (HIGH)(magenta) Widespread severe storms expected. Long-lived, very widespread and particularly intense. Tornado outbreak. Derecho. 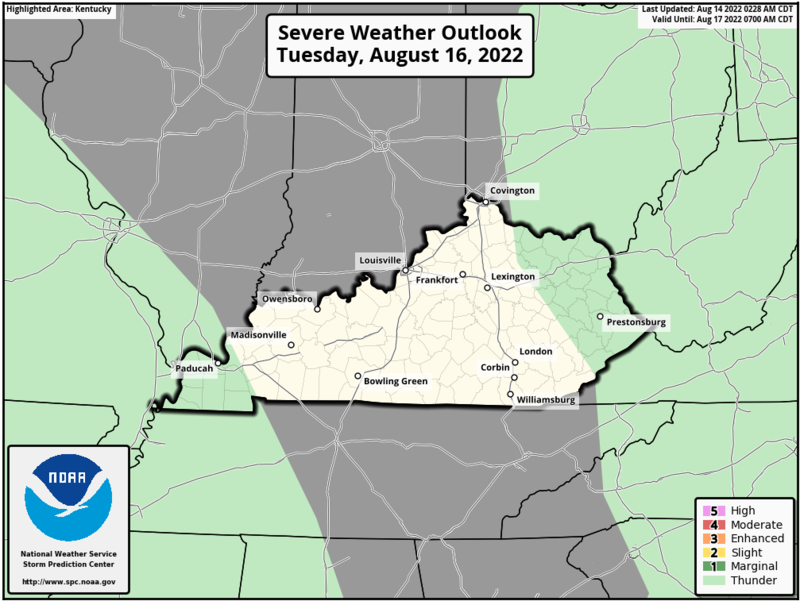 * NWS defines a severe thunderstorm as measured wind gusts to at least 58 mph, and/or hail to at least one inch in diameter, and/or a tornado. All thunderstorm categories imply lightning and the potential for flooding. Categories are also tied to the probability of a severe weather event within 25 miles of your location. This table is adapted from information available on National Weather Service (NWS) Storm Prediction Center's (SPC) website.